The pesky visa requires that every 60 days I cross a national border and collect an entry stamp. The nearest border control, oddly enough, is at our local railway station at the ingress for the daily train to HongKong (XiangGang, 香港, fragrant harbour). This is a good service, in that it reduces the standing in queues to a minimum. The train is fast to Guangzhou (80km; that’s Canton for oldies) and then slow for the last 120km. Macau is only 150km away from Zhaoqing but only accessible by bus or car; it is the other side of the Pearl river estuary (I cannot find a better name – do tell; Google Earth is bad at names for water; the Mandarin is the ZhuJiang Kou, the mouth of the Pearl River) from HongKong and there are frequent ferries between the two. Macao (or Macau, Aumen, ou3men4, 澳门, the Inlet Gate) and HongKong, just 60km away, are the two special administrative regions of the PRC. 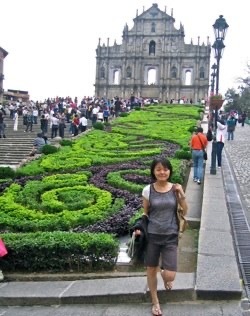 Since GB left HK just before Por tugal left Macau (by 2½ years, 19970701 versus 19991220), Macau is both the first and last European colony in China. The Portuguese arrived in 1535, gaining permission to erect buildings in 1553 and establishing a permanent base in 1557 (for an annual rent). 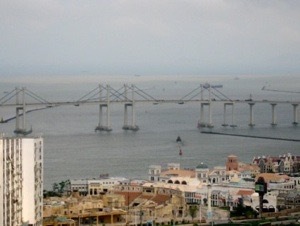 The Dutch made several attempts at acquiring the port in the 1600s. Tertiary education, if it means A-level, is compulsory in the UK. If you take it to mean undergraduate, 413,430 began university in 2007 in the UK, 0.65% of the population and about 0.8% of the over 13s. That doesn’t tell the tertiary level in the UK, which is 31% (post-secondary). The secondary level should be over 90%, even allowing for immigration. Teachers: Your PGCE puts you at Level 7. Level 8 means a doctorate. The same UK 2008 document says “Chinese people [in the UK] are much more likely to be qualified to level 4 or above than any other ethnic group. (54 per cent, compared to a national average of 30.9 per cent).” The number of people (as counted) with no qualifications is (down to) 11.4% - still a scary 3.4 of the 29.6 million considered. These folk are often disabled or otherwise economically inactive. The Opium Wars (also called the Anglo-Chinese wars, so Britain strikes again) followed attempts by opium traffickers based in (British) India to expand their business in the manner of drug lords across the world. Open warfare occurred in 1839-42 and again in 1856-60. China lost both times and Britain gained the Treaties of Nanking and Tianjin, sometimes called the Unequal Treaties. This gave Hong Kong to Britain and brought other nations to seek similar agreements with China, contributing to the Taiping rebellion of 1850-64 and the Boxer rebellion of 1899-1901. Chinese students should review the history of this period as recorded from outside China; western students should seek Chinese views of this period. Some historians see a direct link from the Boxer rebellion to the end of dynastic China (Qing, 1912). Interested readers might extend their review to the 1st World war and look at the spread of foreigners fighting in China, not only Japanese. There is an odd historical attitude to trade in China. The Ming and Qing officials thought trade disruptive at many levels and sought to restrict it (e.g. a 20% import duty) but the restrictions served to develop the ideas of ‘kickbacks and purchased monopolies’ (Wikipedia) that do China no good service still.The opium trade was a near monopoly for the British East India company in Bengal. The BEI (there’s an opportunity for fun by Chinese at British expense, bei being north) traded tea and opium in Canton and Calcutta; government far away in Beijing was effectively powerless to prevent the trade, Of course, as with the US today, you can only sell a drug if there is demand. When the Chinese authorities tried to throttle this trade, things rapidly came to reprisal, increasingly heated exchanges, diplomatic confusion exacerbated by the months of delay in communication and eventual hostilities. A British Indian army was dispatched in 1840 and superior equipment & firepower (encouraged no doubt by experience) meant that there was not much of a contest and a lot of damage was wrought; Canton fell to the British, who also sailed up the Yangtze, capturing the (available, filled) tax barges and hitting China hard in the pocket. So the Qing sued for peace, gave over Hong Kong and the US and France achieved similar treaties (which were what?). The British history gives no clarity to its stance – I found suggestions that neither Britain nor China has been open in its beliefs of the time, including what each side thought of the other. It is not so different even now. Of course, deciding which side is confabulating, dissimulating and otherwise spinning stories remains a game that anyone can play and none can win. The second Opium war developed from the left-over discomforts of the first; the British antagonised Chinese officials (probably out of habit) and eventually a ship was searched in a way that prompted the renewal of the siege of Canton through 1857. 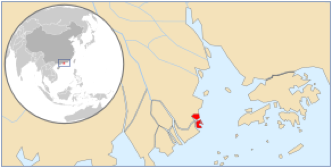 British forces and combined forces with the French took the forts on the Hai river (picture shows the Hai basin, particularly, it goes through Tianjin and Beijing); combined US-British forces took forts on the Hai (sometimes the BaiHe or Peiho; I assume they all mean the stretch from the coast to Tianjin). This brought the combined forces close to Beijing, resulting in the Tianjin treaty and a sharing of all British gains among ‘all major foreign powers’ (Wikipedia; look it up for yourself, it is interesting stuff; Anglo-US and Anglo-French combined forces, though the US combination was much less premeditated). 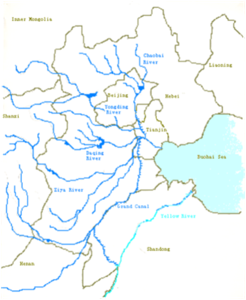 British readers need to grasp the size of these rivers; the river running 15-20km south of the current Tianjin centre is even now 750-950m wide; the one running through the centre is 250m wide. The Pearl river is at least 500m wide even at Zhaoqing and three times that in places. However, looking on Google Earth shows just how very little water in the Huanghe (the Yellow River) is reaching the sea; the river is much bigger upstream – I expect it was much wider – and also more navigable – back then. Whatever, the second opium war ended in Beijing, in September 1860. The next round, the Boxer rebellion, 1899-01, was in the same area in response to a siege of the diplomatic legations in Beijing. The ‘Boxers’ (the Society of Righteous and Harmonious Fists) started the siege and then persuaded enough of the Qing dynasty to support them. The legations held out for 55 days before relief arrived. Eight nations formed an alliance: Austria-Hungary, France, Germany, Italy, Japan, Russia, the United Kingdom, and the United States. This alliance brought 20 to 45 thousand troops (the sources I found differ). This weakened the Qing and led to the creation of the Republic after the 1911 rebellion. 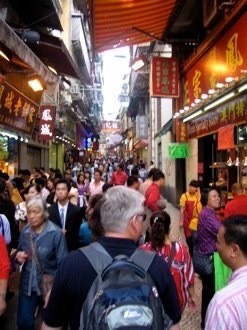 Back to Macau: self-administration came in 1887. This was, sort of, renegotiated with the KMT in 1928, became an issue again in 1949 (when the PRC was created). 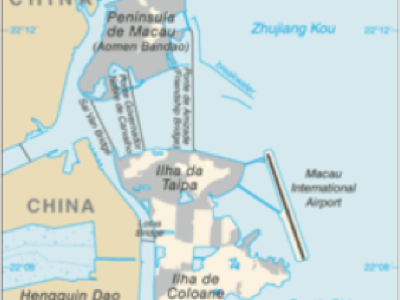 In 1974, Portugal changed as the Salazar dictatorship was replaced, and the new government decided to relinquish all overseas claims; at this point Macau became “Chinese territory under Portuguese administration” and in 1986 changes began resulting in the hand-over in 1999. As with Hong Kong, the constitution of Macau guarantees a fifty year period free of change (except for defence and foreign affairs). So the laws stay, as does the administrative system (executive, judicial, legislative). It has its own currency, police forces, border controls – just as Hong Kong does. 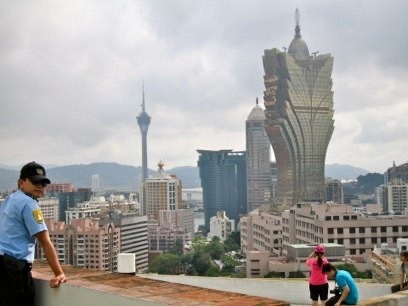 Macau: a nice place to visit. Wode nan niu? My cow, of course! I have quoted sources as appropriate. I wrote this piece myself. I used brown later where it doesn’t read as me, not yet having the habit of identifying quotes.